AMD - Radeon HD2400 ATI Radeon HD 2400 256MB DDR2 SDRAM. PCI-Express x16 Video Card. Processor Speed: 650MHz. Maximum Resolution: 2560 x 1600. Dual Display video output through DMS-59 and TV-Out connectors. Hewlett Packard - ATI Radeon X1600XT 256MB HP ATI Radeon X1600XT 256MB GDDR3 2x DVI S-Video PCI-Express Graphics Video Card 419543-001. ATI - Radeon X1600 Pro ATI Radeon X1600 Pro 512MB GDDR2 D-Sub S-Video DVI PCI-Express x16 Graphics Video Card 102A6761114. 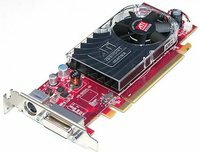 ATI - Radeon X1600 Pro 512MB ATI Radeon X1600 Pro 512MB GDDR2 D-Sub S-Video DVI PCI-Express x16 Graphics Video Card 102A6761114.